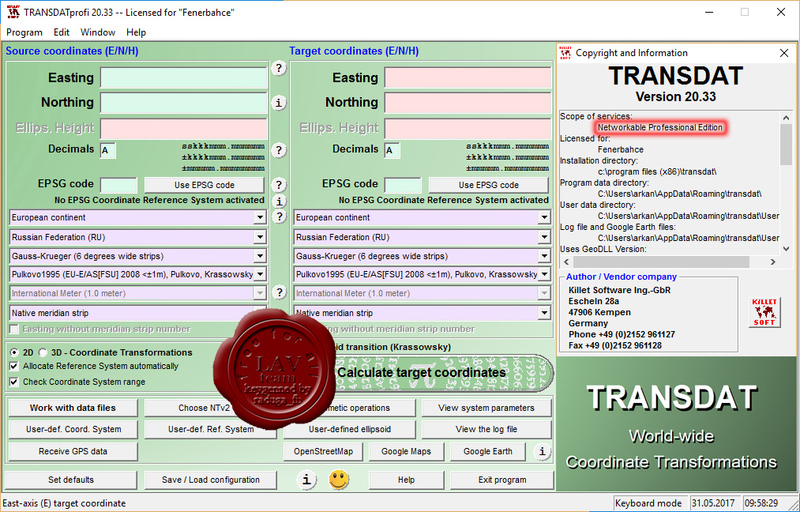 TRANSDAT executes coordinate transformations and geodetic datum shifts between many coordinate and reference systems of America, Australasia, Europe, Germany special and world-wide, with high precision and high performance. The current and many historical coordinate and reference systems of all countries of the European Union including the eastern extensions and the systems of the European non-EU countries. The European ETRS89 systems forced by INSPIRE with respect to the continental drift. The US and Canadian State Plane Coordinate Systems (SPCS) and other systems of the North American continent. Many coordinate and reference systems of the countries of all continents and the world-wide used coordinate and reference systems. World-wide NTv2 grid file supported coordinate transformations. The coordinate and reference systems of the old and new German Federal States, the 40 Prussian Soldner Land Registers, the German 'Lagestatus', special reference systems of the German Federal States and BeTA2007. User defined coordinate systems, reference systems and earth ellipsoids.